Happy Nurses Week (May 6 – 12) to all present and future nurses out there! I thought it would be fun to share some interesting facts about the founder of “modern nursing”- Florence Nightingale. Florence had many firsts in nursing but did you know that her family did not want her to be a nurse? At that time (1853) nursing was considered a job for the undesirables in the community, not for a well bred lady like Florence. As a way to discourage Florence, her family sent her away to Europe with family friends. While in Germany Florence would meet the superintendent of the Kaisersworth School for Nurses, which further pique her curiosity of caring for the sick. Florence remained in Germany where she received 3 months of formal nurse training. In 1854 Florence Nightingale was recruited by the British Military to help introduce female nurses into military hospitals in Turkey. Doctors were not happy to see female nurses in military hospitals but as the reality of war set in nurses became valuable and welcomed contributors to the sick and dying veterans. 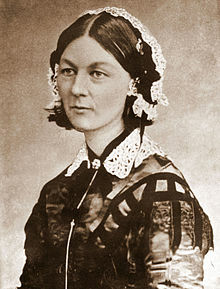 In 1860 Florence Nightingale would open her own School of Nursing in Britain. Soon to be nurses would receive one year of training on the wards of St. Thomas Hospital (no sitting in classrooms, it was all hands on training) After training these nurses would be sent all over Europe and to the United States. It wouldn’t be until 1870 that two Schools of Nursing were established here in the USA, one in Philadelphia and one in Boston. She also had many of her writings published, one titled Notes on Nursing: What it is and What it is Not, which described her observations and concepts of what nursing is and should be in the future. She believed nurses should not be managed by hospitals and doctors but by their own nursing organizations, their own education and their own nursing practices. Florence Nightingale also was the first to see patients as a whole, what we call Holistic Nursing today, treating not just the symptoms but the environment you live in, how you feel and what resources you had available to you and your beliefs systems and most importantly she believed in prevention of illness. Thank you, to Florence Nightingale for leading the way, for not listening to your family when they told you nursing is not a descent profession, for making it one of the most respectful, sought after, recognized profession today. We’ve become so technological and task oriented in nursing today that sometimes we forget there’s a person in front of us. I challenge you to see your patients/clients in a new way. Next patient you see touch them when you’re talking to them by putting your hand on their shoulder or even shake their hand when you first introduce yourself and take 5 extra minutes to listen and really hear what they are saying. You’d be amazed at the difference it can make by doing these two simple acts. Let’s get back to what Florence Nightingale started.